I sometimes forget just how extensive was the German Occupation of former Imperial Russia after the Treaty of Brest Litovsk. It is worth Googling and looking at the map! 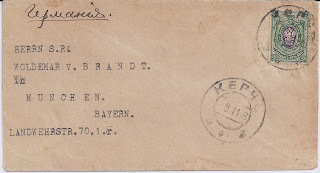 Here for example is an ordinary business letter from the port of KERCH on the extreme eastern tip of the Crimean peninsula, but occupied by Germany in 1918 after the Treaty of Brest-Litovsk. It was posted there on 9 11 18 just two days before the general Armistice of 11 11 18 and despite all the military and political upheavals, appears to have arrived in Munich. Though the cachet on the reverse - the number 499 in circle - does not tell us when, I think it is a regular Munich distribution mark, not a censor cachet which could have been applied anywhere along the route. 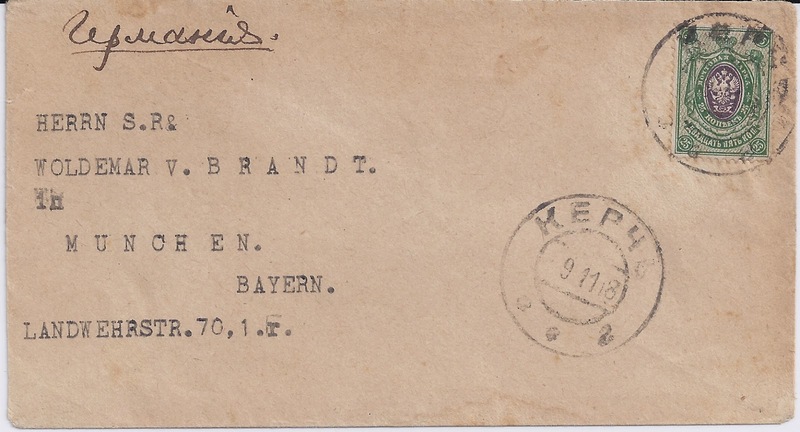 Though the address is typed in German, "Germany" is written in Cyrillic at the top left. It's the Tariff of 25 kopecks which made me look twice at this apparently unremarkable letter. But if the port had been under the control of the Ukrainian National republic at this time, I would expect the stamp to have a Trident overprint - tolerance of unoverprinted stamps ended in October. So who was in charge of the civilian postal service at this date? The cancellation is one which continues in use during the Civil War - I have seen it on Denikin stamps. It was the Crimean Government under General Sulkevich in charge of the postal service at that time. The same postal rates as in the neighbouring Ukraine were effective there and Imperial Arms stamps without any overprint (the 35 kop/1 kop. stamp was issued later) were used for franking the mail. Suleiman Sulkevich was an interesting character from that period. Born a Lithuanian Tatar in a small village near Minsk in Belarus, he was an officer of the Tsar's army. In 1917, he was allowed to raise a Moslem Corps for the provisional government, with the blessing of General Kornilov. After the 1917 revolution, a Crimean Republic was formed. The Ukrainian Rada in Kiev refused to recognition but had no power to suppress it. After the Germans had overthrown the Rada and installed the Hetman Skoropadsky, he urged them to eliminate the Crimean Republic, and sent his own Ukrainian brigade under Gen. Natiev in April 1918. The Germans followed in tow. Meanwhile, Sulkevich offered his Moslem Corps to the Crimean Republic. Gen. Kosch accepted the Moslem Corps in May, but soon after its arrival, it was disbanded for fighting with Natiev's soldiery. Natiev himself was forced to leave and Eichhorn's occupation came into force. In August, the hetman himself went to Berlin to urge for the union of the Crimea to the Ukraine, and he was opposed by the Turkish diplomatic corps, acting on behalf of Seidhamet’s office. But the Germans were worried that the Crimea would become a Turkish province, and hastened their support the hetman. Gen. Kosch told Sulkeivch on 6 September 1918 that the German government did not recognise Crimean independence and was working to bring it into a union with the Ukraine. Sulkevich accepted this revelation and reorganised the government. The new regime was called the Crimean Atonomous Administration, and the local government was to be a coalition of all ethnic members of the peninsula, not just Russians who collaborated with Sulkevich. The hetman called on a Crimean delegation to come to Kiev. Sulkevich complied and sent a batch of Russians and Tatars who arrived there on 5 October 1918, but they refused to swear allegiance to the hetman. Prinz zu Reuss, Germany’s “special representative” to the Crimea, suggested a putsch to overthrow Sulkevich, and Kosch’s occupying Corps in Crimea was informed Sulkevich no longer had authority, but now Suleiman Krym or V. Nalbandov, either one, was the leader of the Crimea. This was pure anarchy, as neither of these men had any authority at all. On 12 November, the Germans were informed of the armistice terms and ordered to evacuate the Crimea. Prinz zu Reuss informed Sulkevich that he could no longer count on German support. When the Germans finally abandoned the Crimea in mid-November, Sulkevich saw no hope for his government and he fled to Baku in Azerbaijan. His only gratification was that Skoropadsky had to flee the Ukraine even before he had to flee the Crimea. Sulkevich meanwhile joined the Musavat Party in Baku and attempted to rally public support for the independence of Azerbaidjan, but Lenin decreed in 1920 that the Transcaucasus be restored to Russia and the Red Army invaded through the Derbent Pass, breaking a recent friendship treaty signed by Baku and Moscow. After the Red Army defeated the National Army, Sulkevich was arrested and executed as an enemy of the state.